With more than 7 million individuals participating in online meetings every month, the Web-based meeting facilities provided by Cisco WebEx (plus uncounted others served up by competitors) have become a ubiquitous means of quickly sharing information when you can’t be there in person. Services like WebEx were pioneered a decade ago and, until recently, were limited to Windows users. Support for other operating systems—most notably, Apple’s Mac OS X—has since been introduced, but participation in sessions has always required access to a computer. No PC? That meant listening to other people talk about the presentation or graphics driving the session—rarely productive, and almost never satisfying. Meet Market: Launch Cisco WebEx Meeting Center for the iPhone, and the app will show you a schedule of your meetings for the coming week. With Cisco WebEx Meeting Center for iPhone, all of that has changed. Cisco earns high marks for the vision and effort associated with bringing the WebEx experience to the iPhone. And a recent update to the app has resolved most of the limitations of the original version, delivering a nearly perfect solution. The ability to schedule meetings directly from the application is the most welcome improvement to the updated WebEx Meeting Center. That feature also brings support for ad hoc meetings, so users can now kick off a meeting whenever, and wherever, they desire. Those additions significantly boost the utility of the application. You also gain the ability to invite participants from within a meeting. Meeting Center is integrated with your iPhone’s address book, so it’s easy to find individuals and add them to the invitation. Cisco has also cleaned up the process of rejoining the meeting after you’ve left it, either on purpose, perhaps to run another application, or accidently, such as when you receive a phone call. Leaving a meeting now cleanly disconnects both your voice and visual connection to the session, making it simple to rejoin the meeting when you’re ready. Version 1.2 also sports a number of smaller improvements, such as refined instructions. On starting the application, you’re connected to a schedule of your meetings for the upcoming week. Delays in connecting to one WebEx server were encountered in testing. However, this appeared to be a unique problem, not encountered by most users. Once you’ve connected to the server, meetings are easy to kick off. Simply select the desired meeting from the app’s calendar and click start. That opens the meeting for attendees, and prompts the WebEx server to call your iPhone. After you answer, the application itself interacts with the WebEx system to log you into the voice session. To join the visual portion of the proceedings, you’ll need to return to the iPhone’s Home Screen, and restart the Meeting Center application. You’ll see a list of attendees and get the option to view any visuals—presentations, demonstrations, and so on—being shared. That process, a result of multi-tasking limitations in the iPhone OS, is a bit cumbersome the first time through, although Cisco has added instructions to clarify what’s happening for new users. Audio and visual aspects of meetings are robust and impressive. By default, as host of the meeting you’re made the presenter. You can re-assign presentation abilities by using your finger to slide a WebEx icon to another individual. You can also send instant text messages to all attendees or to individual participants. The Meeting Center application takes full advantage of the iPhone’s pinch-and-scroll capabilities for close-ups of visuals, and it supports viewing in both portrait and landscape modes. While the smallest text will be hard to make out (another argument against too much text on presentation slides), the vast bulk of material is surprisingly clear and legible. Speaker’s names are superimposed over the shared visuals—an especially helpful feature when meeting with people whose voices are unfamiliar. While you can view content shared from any computer, you can’t yet present visual material from the phone itself. To be fair, limits in the current iPhone OS’s multitasking capabilities make that impossible to do, but it does limit the utility of the app. On the voice side, WebEx offers a useful Voice-over-IP service, but it’s not accessible from the iPhone. As a result, iPhone users with a weak cell connection—and all iPod touch users—will require a secondary phone line to participate in the voice conference. Although some limitations remain with the app, Cisco developers deserve credit for delivering an innovative product that has the potential to significantly expand people’s productivity. Cisco WebEx customers—especially those on the go—shouldn’t hesitate to take advantage of this iPhone client. 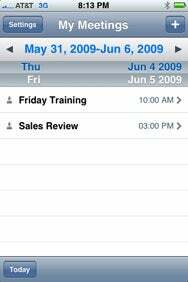 Cisco WebEx Meeting Center is compatible with any iPhone or iPod touch running the iPhone 2.1 software update. An iPhone with access to a 3G cellular network or Wi-Fi connection is required for full standalone functionality. Users on slower networks can still access meetings, but they’ll have to choose between viewing visuals or participating in the voice conference.